Hi guys. I saw that there's a deal for a round trip for 4000 yen. Can this be purchased at a ticket machine or do I have to go to a counter to buy this? Thanks! Counter - you have to show foreign passport. Use is within 14 calendar days and you do not need to return from the same station (eg go to Shibuya, but back from Shinjuku is allowed). Thanks! And do I need to go to the counter the day before I go back to the airport to book a seat at a certain train then? You can book/reserve the seat on the day of travel if you want. If you fit in a visit to a ticket office in your last few days (or any JR ticket office in Japan) you can do the seat reservation easily. You don't need to do it, though, reservations are no longer mandatory on the N'EX. There are still no non-reserved seats; instead you just use any vacant seat (but you have to give it up if someone comes along with a reservation for it). Thanks guys. Last question: does the train go directly to Shibuya from Narita or do I have to change trains somewhere? Except when you are in a hurry, I see no merit in going without seat reservation for your ride on a Narita Express train. There is no sign in a N’EX train to indicate whether a seat is reserved or not, so you cannot know easily in advance whether you may have to vacate your seat. does the train go directly to Shibuya from Narita or do I have to change trains somewhere? In the evening, depending on the timing, the earliest-departing N’EX train which you can catch does not go for Shibuya. In that case, you can take a N’EX train departing about 30 minutes later, which has a part to go for Shibuya. Narita Express trains leaving the airport mostly have two destinations. and the other to make a stop at Shinagawa then go for Yokohama. There are also seven Narita Express trains (#12, #18, #22, #28, #34, #42 and #48) which have only one destination; they all make a stop at Shinagawa. Five trains among them go for Shibuya; the other two trains (#42 and #48) go beyond Shinagawa for Yokohama, not for Shibuya | Shinjuku. There’s a single ”line” and a double ”line” in the time table. What does that indicate? There’s a single ”line” and a double ”line” in the time table. The mark "|" indicates that the train skips the station. The mark "||" indicates that the train goes not via the station. By the way, what place in Shibuya will you head first to? Shibuya is a city of slopes; knowing the name of a slope may help you to find your way. Shibuya Station of JR is at the bottom of Miyamasu-zaka and Dogen-zaka Slopes. As a result of the ongoing redevelopment works, Shibuya has been changing in recent years, especially around the station buildings. Currently in JR Shibuya Station, you cannot walk from the platform for Narita Express directly to the exit for Hachiko Square, where the statue of the dog Hachiko stands. : The shaded areas are under construction works. The Shibuya station complex is composed mainly of two buildings. The building on the ground still has some parts to be reconstructed. The underground building seems completed; Exit 8 is close to Hachiko Square. 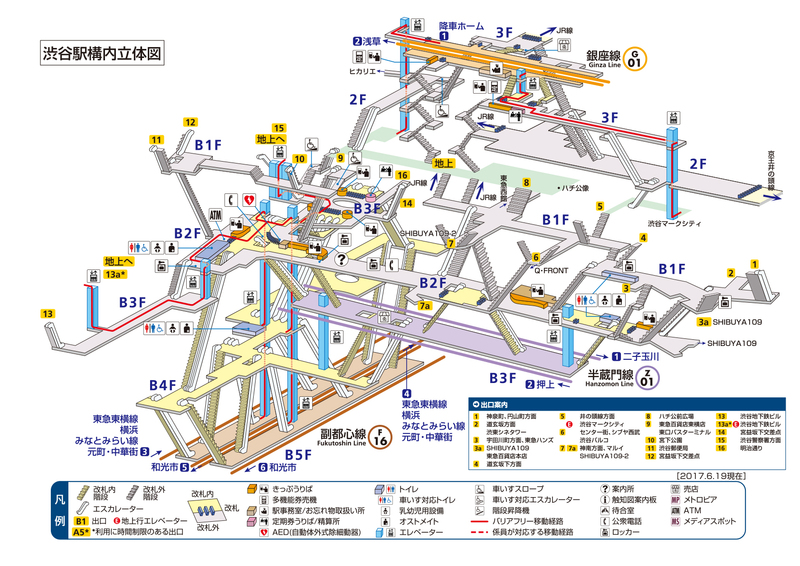 Please note that subway Shibuya Station is divided into the two buildings. The platforms for the Ginza Line are on the 3rd floor above the ground. The platforms for the Hanzomon Line and the Fukutoshin Line are under the ground. The underground tracks are used by Tokyo Metro and also Tokyu, which operates two non-subway lines from Shibuya. Thanks for all the info, omotenashi! Well, a good walker can walk from the N'EX platform to the hotel, but you may hope to take a taxi for a few minutes from near Miyamasuzaka-shita crossroads; a one-way taxi fare is estimated at around 500 yen per car per ride. Probably the simplest way is to go up Miyamasu-zaka Slope then go down Aoyama Street, but that sounds not easy for travelers carrying some luggage. In Shibuya Station you see signs written in black letters on a yellow background. You first get out to East Exit. 1. Your Narita Express train arrives at Track 3 of Shibuya Station, and you disembark. and go up the escalator | elevator to the passenger bridge. and go down the escalator | elevator near Central Gate to the platform of Track 2. 4. Then you walk a little, and go down the escalator for South Gate. and walk on the pathway to East Exit. and walk northward along Meiji-dori Avenue to near Miyamasuzaka-shita crossroads. 7. You catch a taxi. Your walking route from South Gate of (JR) Shibuya Station is explained in English on the website of the hotel.